As new mothers, we all want to take good care of ourselves while making sure nothing we have on or around us does hidden damage to us or our kids. I loved that our community had a lot to say about the topic in our last post on clean beauty, on the site and Instagram. 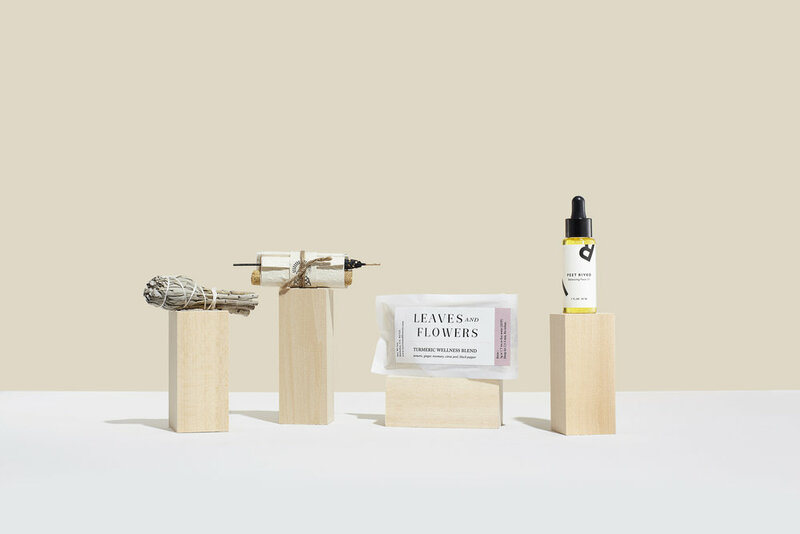 I was introduced to natural skincare through Johanna Peet, the founder of Peet Rivko, a plant-based line that proved the strength and softness of natural products. Their packaging happens also to be gorgeous - that's their new Rituals Box pictured above. Beyond having a line that simply works, Johanna is passionate about the topic, recently going to Capitol Hill to lobby for higher standards for the industry. Given the collective interest among us, Johanna offered some guidance for anyone else who may like the concept of clean beauty but are still making sense of it all. Written by Johanna Peet, the founder of Peet Rivko. I think it’s a really exciting time to be in clean beauty. We’ve come so far in the last few years. Product formulations, R&D, packaging – they have all have advanced to the point where you can use entirely clean, non-toxic and natural products without compromising on performance or efficacy. When I started Peet Rivko, I was shocked to learn that the beauty industry is essentially unregulated. The FDA (the agency that oversees cosmetics) has not passed any major legislation regulating the industry since 1938. And while the European Union bans over 1400 chemicals from personal care products, here in the U.S., we’ve banned 14. The FDA can’t even pull a defective product from the shelves. It’s absurd. As a result, it’s really up to the consumer to understand what’s in their products and what ingredients to avoid. How do you read a beauty label? Brands are required to list ingredients from the highest % ingredient to the lowest, so the first few ingredients are typically the bulk of the formula. Pay attention to what’s at the top of the list and look for plant-based ingredients vs. synthetics. Resources like EWG have a database where you can type in any ingredient and see what it’s used for and a toxicity score. Even natural ingredients can sound unnatural: Unfortunately, the one thing the FDA does mandate is the use of archaic label names. Brands are required to label products using an ingredient naming system called INCI (International Nomenclature of Cosmetic Ingredients) which uses scientific names that can be hard for you or me to understand. For example, fractionated coconut oil is a very common ingredient in natural skincare but must be labeled as “capric/caprylic triglyceride” – which sounds like something very different. If you’re unsure if an ingredient is natural or synthetic, do a quick google search or check EWG. Sometimes something that sounds like a synthetic is actually quite harmless. What should we absolutely avoid? If you do one thing, stay away from the most toxic of the toxic: phthalates, sulfates, parabens, formaldehyde, petrolatum, BHA/BHT, tricoslan, methylisothiazolinone, PEG compounds and toulene. Fragrance or “parfum” is also often a problem – it’s somewhat of a loophole for ingredient labeling and companies can use it as a “catch-all” for toxic compounds. What's the difference between "Natural", "Non-Toxic" and "Organic"? All three terms are used to describe beauty products, yet often in confusing ways. The term “natural” is not regulated, so brands can claim to be natural yet have mostly synthetic ingredients in their products. Look for alternative terms like plant-based or 100% natural for more context – and dig deep into the ingredient list if you’re still unsure. Non-toxic is also an unregulated term, though it tends to refer to products that exclude toxins such as those listed above. A product may include 100% synthetic ingredients but still be considered “non-toxic” because of what is excluded. And finally, there is “organic” which I’m happy to report is regulated and defined by the USDA. It refers to a % of organic ingredients and should be accompanied by certification on the packaging. If we're new to this, where do we start? What are some of your favorites? Peet Rivko Balancing Face Oil – I love all of our products but if I had to choose just one, it would be our Balancing Face Oil. It’s lightweight yet super hydrating and leaves your skin soft without a greasy finish. I have really dry skin and use it morning and night. For combination or oilier skin, I recommend using only at night to start. Like all of our products, it’s completely fragrance-free, including no essential oils. Kjar Weis Cloud Nine – I have learned from trial and error that I have really greasy eyelids – someone once told me that it means I’ll have no eye wrinkles when older (a lie to make me feel better?) but so far it’s only meant that most natural eyeshadows slide right off my eyes after just a few minutes. The one exception is Kjar Weis. Their eyeshadows are beautiful. I use Cloud Nine as my go-to base and love their refillable packaging system. RMS “Un” Cover-up – I am obsessed with RMS makeup. I use their concealer daily, officially called “un” cover-up. I invested in two shades which carry me through winter and summer. I also use their buriti bronzer and living luminizer. The products are not necessarily the longest lasting but they give the perfect, natural glow and never leave my skin flaky or dry. ILIA Tinted Lip Conditioner – I think of this as grown-up lip gloss. It’s sheer coverage that’s free of toxins and yet moisturizing like a lip balm. I always have this on me. My favorite shade is Blossom Lady – it’s a rose/pink that is a bit color without being too much. Rahua Classic Shampoo and Conditioner – It took me a while to stop using the cheapest shampoo I could find, but Rahua products are an investment that I think is well worth it. It’s one of the few natural shampoos that doesn’t overly strip or dry out my hair (which is quite dry + fine). Tenoverten & J. Hannah Nail Polish – For polish, I love Tenoverten and J.Hannah. Tenoverten has several salons in NYC, and if I’m ever getting a manicure in Brooklyn, I just bring my own with me. Favorite shades: Ghost Ranch by J. Hannah, Ludlow by Tenoverten for summer and Market for fall/winter. Dr. Bronner’s Body Wash – I started using Dr. Bronner’s in college and haven’t stopped. It’s simple, natural and affordable. I have no plans to ever stop using it, though when you actually stop and read the text on the bottle, it is a bit intense. I love their unscented soap and peppermint.